What is the return on equity? How to calculate return on equity? What is a good return on equity? 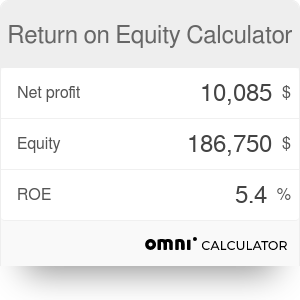 Return on equity calculator was made to help you calculate ROE. This is a very popular and important indicator in business which shows how efficient the company is. In this short article, you will find out what is the return on equity in general and what is a good return on equity. Additionally, we will quickly explain what is the difference between the return on equity and return on capital. To learn more, go straight to the paragraph titled return on equity vs. return on capital. Because you're interested in ROE, you might also want to check out other business calculators, such as the ROA calculator, which measures the profitability of a company in generating profit from its assets. First of all, let us answer the question: what is the return on equity?. ROE (Return on Equity) is a ratio of profitability which shows how much profit the company has managed to make from its equity. In other words: this is the company's ability to generate profit with the money that shareholders have invested. ROE is also known as "return on net worth" (RONW). Now, when you already know what is the return on equity, you may ask: how to calculate ROE? Let's find an answer! What will the value of ROE be in this case? While we already know what ROE is, there's a next question to pose. It sounds: what is a good return on equity? The value of ROE should be as high as possible. The higher the ROE of a company, the firmer and more beneficial its situation on the market. Apparently, the best value of ROE is about several dozen percent, but such a level is difficult to reach and then to maintain. A good return on equity is much lower. Economists say that it is about 10-15% - such value is supposed to be likely to keep. The problem for many people is to notice the differences between indicators which seem to be similar. That's why we have made a quick comparison return on equity vs return on capital as they are close to each other. ROCE (return on capital employed) is a ratio which indicates the profitability of the investment in which the whole employed capital of a company is engaged. As opposed to ROE, ROCE considers not only the equity but also liabilities. Thanks to this fact, it is more useful when we want to analyze a company with a long-term debt. Return on Equity Calculator can be embedded on your website to enrich the content you wrote and make it easier for your visitors to understand your message.